This week, Karl and I turned an errand to pick up fish food from the Don Clauson Hatchery (for an experiment later this summer!) into a field trip to learn about the Russian River’s Coho Broodstock Recovery Program. 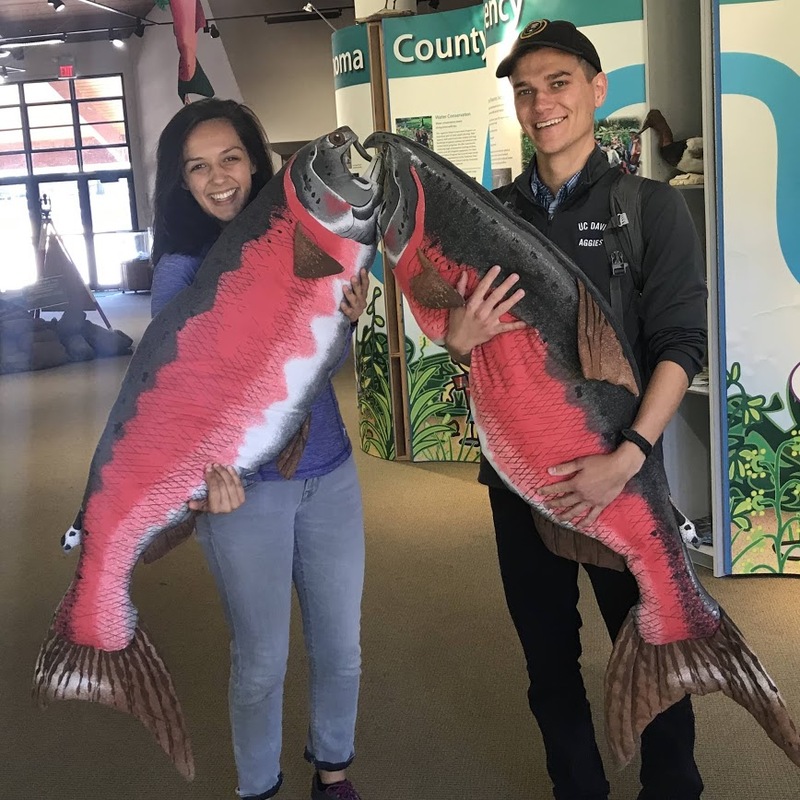 We met at the Hatchery Visitor Center in Sonoma County for a tour of the US Army Corps of Engineer’s facilities where salmon are being raised for release back into the wild waters of the Russian River Watershed. 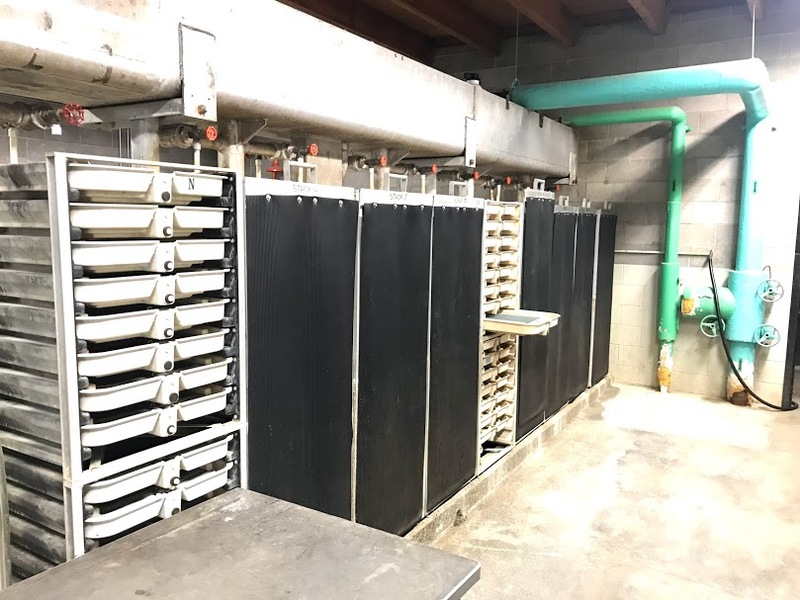 The Don Clauson Hatchery began a stocking program in the 1980s to release Steelhead Trout into Dry Creek (a tributary to the Russian River) for recreational fishing. In the 2000s, the facilities expanded to include a conservation program for endangered Coho Salmon in an effort to increase the number of adults spawning in the Russian River Watershed. Fisheries scientists began collecting Coho fingerlings (juvenile salmon almost ready to migrate to the ocean) from throughout the watershed to raise in the hatchery and use as broodstock (breeders) for spawning. Each fish brought into the facilities is given a PIT (passive integrated transponder) tag for identification and a piece of their fin is clipped for genetic analysis. Once the fish have reached adulthood, they are sorted for sexual maturity. Throughout December and January, females have a short two week window when they are ready to spawn. During “ripeness sorts”, hatchery scientists test for color, softness of the abdomen, and will even use ultrasounds to detect when the female is ready to have her eggs removed. In the wild, when Coho return to their natal creeks to spawn, the female fish dies leaving behind a redd (nest) full of eggs and her carcass. In hatcheries, the female is euthanized and her eggs are removed. Once the eggs are removed, they are taken to the Incubation Facility. During incubation, trays are filled with eggs from one female and are divided into four sections. Each section is fertilized by milt (sperm) taken from a different male. Breeding pairs are selected using a genetic matrix prepared by geneticists as the South West Fisheries Science Center in Santa Cruz, CA using the fin clip taken when the fish was brought into the facility. Genetic matrixes match the most distantly related individuals to avoid inbreeding and improve genetic variability within the population. Once the eggs hatch, they are taken to the nursery and are fed and cared for until release. The hatchery returns 300,000 young Coho back into 20+ creeks throughout the Russian River watershed! Numbers of Coho are improving each year as more adults are returning to creeks to spawn. 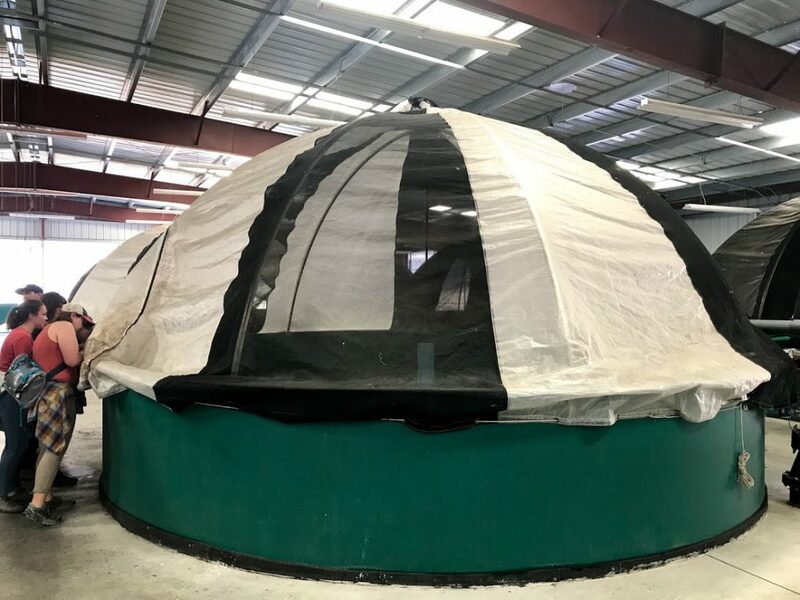 The success of the Don Clauson hatchery program in saving Coho from local extirpation in the Russian River watershed has sparked the expansion of the program into a regional recovery effort. 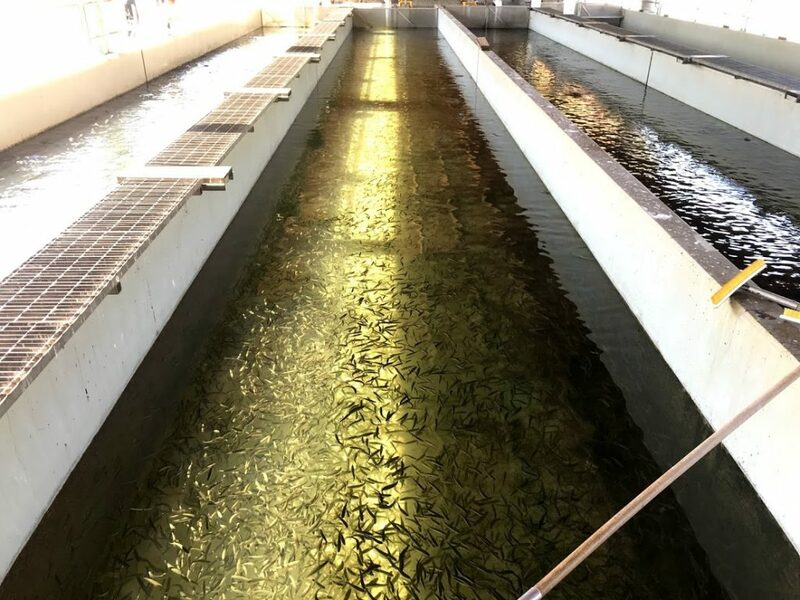 Fish from Redwood Creek in Marin County are now being “rescued reared” in the hatchery facilities. Redwood Creek Coho are being raised to sexaul maturity and then released to spawn naturally in the creek (rather than bred in facility like the Russian River Coho). If these endangered fish are left in the wild, only 2% of juveniles will return to the creek as adults to spawn, but hatchery scientists can return 85% of fish back into the creek to spawn after rescue rearing! 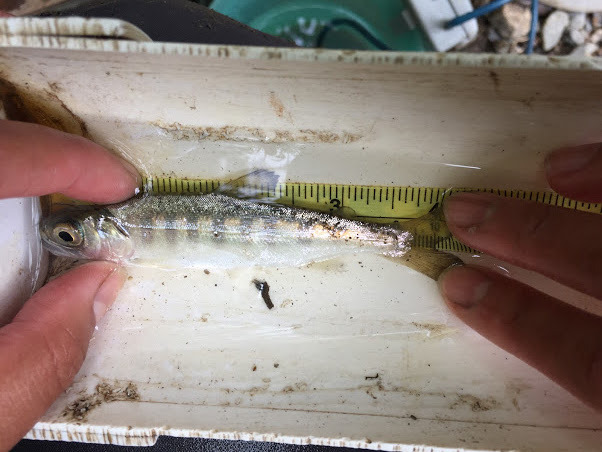 Hatcheries, like Don Clawson, are helping make major improvements in Coho numbers in creeks throughout the region, but these efforts alone are not enough to save this fish from extinction. As the health of our watersheds decline, so will Coho Salmon numbers. If we really want to save this fish, we need to make sure that Coho have places to swim, grow, and spawn. Restoring watersheds will benefit Coho and it will benefit us! If we work together to conserve and restore watersheds, we can all have swimmable and drinkable water. Nina Trusso is an aspiring scientist, passionate conservationist, and California sunshine enthusiast. She graduated from Santa Clara University in 2016 with a bachelor's degree in Biology and Environmental Science. Nina has spent the last two years up and down the California coast doing seasonal environmental jobs. This summer she will be working as the Mosaics in Science Intern with the National Park Service in the Golden Gate National Recreation Area. After this internship, she will be returning to school to get her Masters in Environmental Management from the University of San Francisco.